Going to the United Nations! | Teens Dream Co Lab is a collaborative of teens and adults who encourage teens globally to be change agents in their communities, and the world! Going to the United Nations! I am Ellie Hart (far right) and a high school student from Washington DC. I am also one of the Youth Ambassadors with the Teens Dream Responsible Consumption and Production Dream Hub, which focuses on engaging teens globally in virtual rooms to reduce plastic pollution. This project is a collaboration with the Smithsonian Conservation Commons and the Global Co Lab Network to build a network of teens on earth optimism and sustainable development! On Friday February 22 I had the wonderful opportunity to travel to the United Nations Association of the United States of America (UNA-USA) Global Engagement Summit at the United Nations Headquarters in New York City. 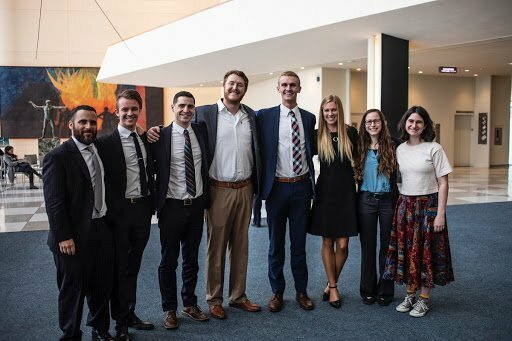 This year, UNA-USA Global Engagement Summit gathered 1,800 change-makers from across the country, representing 45 states, DC, and Puerto Rico to attend sessions with expert panelists and plenaries. I arrived early to the opening plenary, having been advised that UN security can take a long time, and had the opportunity to talk to a few graduate students and people working on veteran’s rights. The opening plenary was delivered by United Nations Secretary-General Antonio Guterres. The Secretary-General devoted most of his speech to discussing the pressing threat of climate change. It was inspiring to hear the Secretary-General speak about an issue so important to me, and one related to our work at the plastic hub, since plastic production and waste impacts climate. Throughout the day, I went to sessions on human rights, climate change, and food security. I enjoyed hearing from diplomats, advocates, and ambassadors about the work they are doing to make a difference in the world. The highlight of my day however, had to be the meeting I had with Michael Scott Peters, the U.S. Youth Observer to the U.N. Peters travels around the country talking to youth leaders about what is important to them and educating them about the U.N. I met with Peters, along with people from the International Orchestra of Refugees, which aims to connect displaced musicians, and ImpactEd, which gives college students real world problems to solve for companies in exchange for credit. I got to share about my work and hear about what others are doing in their fields. I felt inspired by the great strides others are making, since they are all relatively new groups as is mine. Talking to Peters and the others gave me hope that everyone’s work will pay off over time and helped me feel like the U.N. is listening to those it serves. Overall, I had a wonderful time at the 2019 UNA-USA Global Engagement Summit!